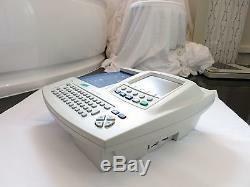 WELCH ALLYN CP200 ELECTROCARDIOGRAPH ECG MACHINE. 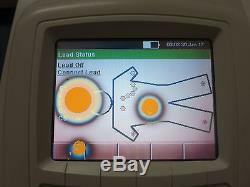 Welch Allyn® CP 200 Resting ECGs. Come with an intuitive design and advanced software features that make taking electrocardiograms fast and easy. ECG features full alphanumeric keyboard and LCD display with advanced filters for optimal ECG trace quality to ensure accurate readings. Customizable report formats allow you to print information just the way you need it. Instant-on feature powers up the ECG device and lets you take an ECG quickly. Unfortunately circles on LCD screen but works perfectly. 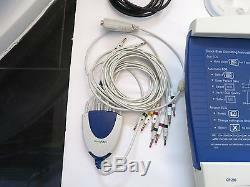 12 Channel interpretive ECG with LCD screen and alphanumeric keyboard. Lead quality graphic saves time by highlighting poor connections. 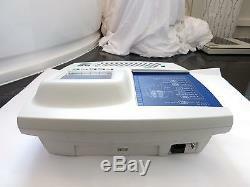 Individually replaceable patient leads are easy to use and more cost-effective to repair. Advanced filters for optimal ECG trace quality ensures accurate readings. Instant On' means you can take an ECG at a moment's notice. Optional SD card and CardioPerfect software stores information and transfers results to Electronic Patient Record system. Customisable report formats prints the chart-sized reports you want in the format that works best for you. Mains and battery operation - will continue to function with a flat battery when connected to mains. Colour ECG waveform screen to make it easier to identify critical information. Dedicated function keys save time to perform the most common functions. Store up to 100 ECGs. Transfer tests to CardioPerfect Workstation software either by use of standard SD card or direct cable connection for attachment to Electronic Patient Record systems. Dimensions : 41 x 40 x 16cm. 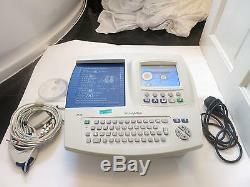 The item "WELCH ALLYN CP200 RESTING ELECTROCARDIOGRAPH INTERPRETIVE ECG MACHINE PATIENT UK" is in sale since Wednesday, November 1, 2017. 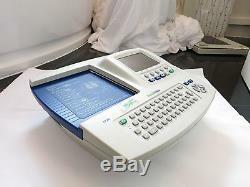 This item is in the category "Business, Office & Industrial\Healthcare, Lab & Dental\Medical & Lab Equipment, Devices\ECG & EKG Machines". The seller is "speedyauctionsuk" and is located in Birmingham, West Midlands. This item can be shipped worldwide.